Mo’Nique has been on a media blitz since writing her essay for the Hollywood Reporter about being blackballed. The story has evolved from Mo’Nique’s being told by Precious director Lee Daniels that she was blackballed to her actually saying she was lowballed, and now saying it was Daniels who actually blackballed her. 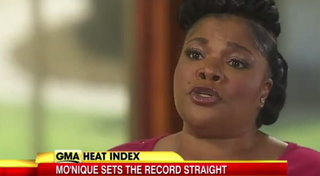 In an interview with Good Morning America, Mo’Nique clarified her stance further. “People were saying, ‘Someone needs to teach Mo’Nique a lesson because she’s not playing the game, and she’s gonna get in her own way of winning this award, because it seems like she’s choosing her family over Hollywood.’ I don’t think Hollywood has turned his nose up to me. I think that those are feelings that Mr. Daniels is having,” Mo’Nique told Good Morning America. Gabourey Sidibe, who starred as Precious, had her say on Twitter about the recent drama surrounding Mo’Nique’s accusations. One thing is true: You can’t change someone’s perspective about the situation in which they’re involved. If Mo’Nique’s perspective is one that includes her feeling that she was blacklisted, then that’s her right. But the reality of the matter is, speaking out against it may actually do more harm than good. Hollywood doesn’t like to be called out on its BS, even if the one being called out is part of the small population of “black” Hollywood. But something tells me that Mo’Nique is going to be just fine.